October 7, 2005: Last month, the sun went haywire. Almost every day for two weeks in early September, solar flares issued from a giant sunspot named "active region 798/808." X-rays ionized Earth’s upper atmosphere. Solar protons peppered the Moon. It was not a good time to be in space. "The crew of the ISS absorbed about 30% fewer cosmic rays than usual," says Frank Cucinotta, NASA's chief radiation health officer at the Johnson Space Center. "The storms actually improved the radiation environment inside the station." Scientists have long known about this phenomenon. It's called a "Forbush decrease," after American physicist Scott E. Forbush, who studied cosmic rays in the 1930s and 40s. When cosmic rays hit Earth's upper atmosphere, they produce a shower of secondary particles that can reach the ground. By monitoring these showers he noticed, contrary to intuition, that cosmic ray doses dropped when solar activity was high. The reason is simple: When sunspots explode, they often hurl massive clouds of hot gas away from the sun. These clouds, called CMEs (coronal mass ejections), contain not only gas but also magnetic force fields, knots of magnetism ripped away from the sun by the explosion. Magnetic fields deflect charged particles, so when a CME sweeps past Earth, it also sweeps away many of the electrically-charged cosmic rays that would otherwise strike our planet. This is the "Forbush decrease." A single CME can suppress cosmic rays for a few weeks. Sustained solar activity can suppress them for a much longer time: "2005 has been a surprisingly active year on the sun," notes Cucinotta. Since January, astronomers have counted 14 powerful X-class solar flares and an even greater number of CMEs. As a result, "the crew of the ISS has absorbed fewer cosmic rays all year long." This whole story is ironic because flares and CMEs are themselves sources of deadly radiation. CMEs, in particular, cause "proton storms." En route to Earth, CMEs race through the sun's outer atmosphere, plowing through the hot gas at speeds exceeding a million miles per hour. Protons caught in the path of a CME can be accelerated to dangerous energies. No astronaut wants to encounter a swarm of high-energy solar protons. Severe storms are literally sickening; exposure causes vomiting, fatigue and low blood counts. Without medical attention, an astronaut suffering from radiation sickness could die. Now for the good news: few solar protons are able to penetrate the hulls of NASA spaceships. As long as astronauts stay inside, they're safe. Cosmic rays are different—and worse. Cosmic rays are super-charged subatomic particles coming mainly from outside our solar system. Sources include exploding stars, black holes and other characters that dwarf the sun in violence. Unlike solar protons, which are relatively easy to stop with materials such as aluminum or plastic, cosmic rays cannot be completely stopped by any known shielding technology. No one knows all the things cosmic rays might do to humans. "We haven't been in space long enough," says Cucinotta. Except during brief trips to the Moon forty years ago, he explains, astronauts have never been fully exposed to galactic cosmic rays. 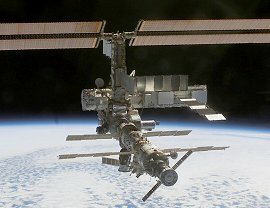 Close to Earth where the ISS orbits, crews are protected not only by their ship's hull, but also by Earth's magnetic field and the gigantic solid body of Earth itself. A 6-month trip to Mars, far from these natural shields, is something new. What are the long-term risks? How much shielding is needed to keep astronauts safe? NASA researchers are grappling with these questions. One thing is clear. "Reducing exposure is a good thing," he says. The sun can help. Every 11 years, solar activity reaches a fever pitch called Solar Max. It last happened in 2000; future episodes are due around 2011 and 2022. During Solar Max, CMEs are produced daily, and the solar wind blows knotty magnetic fields through the inner solar system as a matter of routine. These fields provide a measure of extra protection for trips to the Moon and Mars, dropping cosmic ray fluxes in the biologically dangerous energy range 100 MeV to 1000 MeV by 30% or more. Mission planners of the future might actually schedule long trips through the solar system to coincide, roughly, with Solar Max, thus taking advantage of this decline in cosmic rays. Maybe solar flares aren't so bad after all. Solar Minimum Explodes -- (Science@NASA) Solar minimum is looking strangely like Solar Max. to view cosmic ray dose rates for astronauts orbiting Earth inside aluminum-shielded spaceships during two recent solar cycles. Image credit: Frank Cucinotta. A New Kind of Solar Storm -- (Science@NASA) Going to the Moon? Be careful. A new kind of solar storm can take you by surprise.